IDF soldiers were able to prevent two terrorists from infiltrating into Israel in the Golan Heights, near the border with Syria, on Friday night. According to the IDF, the soldiers identified two suspects tampering with the security fence along the border. It is believed they also tried to place an explosive device. The troops open fired, hitting the two terrorists. “The IDF will continue to protect the border and prevent attacks,” said the IDF Spokesperson’s Unit in a statement quoted by Channel 2 News. Friday’s incident comes only one day after the IDF Northern Command announced that it was changing its orders regarding opening fire in areas along the Golan border fence. Anyone from the Syrian side who comes near the fence should expect to be shot, the IDF said. Previously, soldiers would fire in the air to warn off and ward off suspicious figures. As per the new orders, soldiers will immediately open fire in the direction of suspicious looking characters. There have been heightened tensions along the Israel-Syria border in recent weeks. Last week, an explosive device went off on the Golan Heights, as an IDF jeep was passing by. Three soldiers were wounded in the attack and were taken to the Rambam Hospital in Haifa. One of them sustained serious injuries in the explosion. 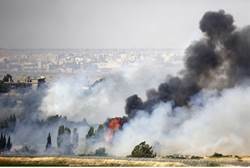 The Israel Air Force (IAF) retaliated several hours later, striking several targets on the Syrian side of the Golan Heights which had aided and abetted the attack against the soldiers. Two weeks ago, also on a Friday night, an explosive device went off as IDF soldiers patrolled near the Lebanese border. No one was injured in that incident, although three soldiers were treated for shock at Ziv Hospital in Tzfat. The following day, Saturday, IDF soldiers identified several individuals approaching the border in a suspected attempt to set another explosive. The soldiers fired on the suspects, who fled.